Graham Turner's Battle of Castillon. The originals on this thread all went into the River Dordogne before the battle, but I'm sure some very similar ones saw some use there. A two-handed sword from the Battle of Castillon in 1453. The blade is presumably German, the hilt English. 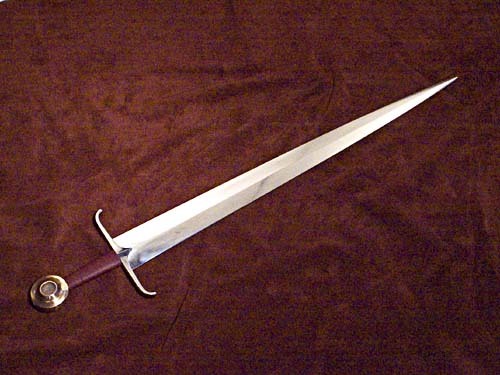 Long, slender, double-edged heavy blade with a mid-ridge. There is a running wolf inlaid in brass on both sides in the upper quarter of the blade as well as a divided shield. 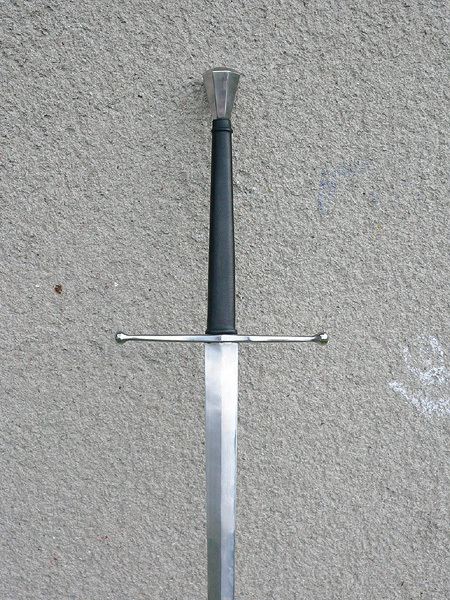 Cross hilt with straight, ridged quillons, round in cross-section, edged in the centre, and lightly shaped toward the point (with organic remnants of the leather scabbard on the undersides). Spherical finials. Pear shaped, facetted pommel with remnants of the iron grip fastenings (braided ferrules). Total length 145.5 cm, blade length 110 cm. Greatest width of blade 5.5 cm. Length of the tang 25 cm. Dark-brown, blackish river patina in the form of Goethite (hydrated iron oxide). The material is in remarkably good condition, with damage restricted to the vicinity of the point. Curatorial protective cover of paraloid. Provenance: Dordogne or Lidoire in the vicinity of Castillon-la-Bataille. Altogether, there have been 80 alleged medieval swords found at this spot. 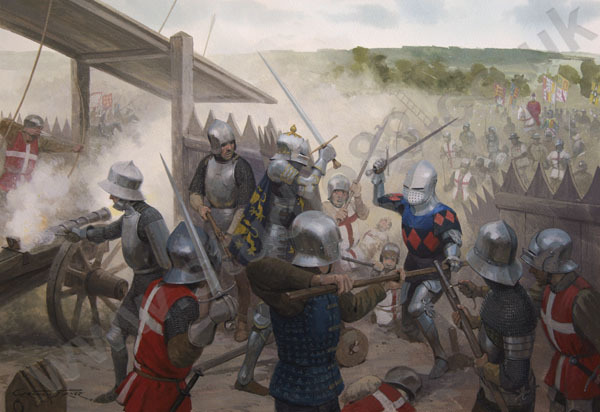 The Battle of Castillon on 17 July 1453 ended the so-called "Hundred Years' War" between France and England. On 17 July, the 60 year old English commander, Talbot, ordered the assault on the French position south of Castillon, after he had received false information that the enemy was pulling back and that an epidemic had broken out in the camp. However, the English attack failed, Talbot and his son were killed, and those left alive attempted to escape in panic-stricken flight. Cf. E. Oakeshott, "A river-find of 15th century swords", in Blankwaffen - Festschrift Hugo Schneider zum 65. Geburtstag 1982 (the type corresponds to No. 16) as well as L. Thompson in "The sword treasure trove" in Man at Arms, Lincoln USA, August 1997. Only one other two-handed sword exists from this group, and it is now in the Tower Collection. Cf. two other swords from this group, Hermann Historica Auction 35, 23 October 1997, lot 1146, and Auction 38, 28 October 1999, lot 819. It seems to me that this sword is not one of those in the original post. Arma Bohemia based their EP 50 on this one. The quillons are ridged and the ends of them are not just round but have eight facets (as the pommel). The pommel is off, it is clearly not pear shaped and the grip on mine has an extra riser at 15 cm from the cross. The leather of the grip is black and the seam does not overlap, it is clearly visible. 3: sold by Hermann H. sale 58, October 2009, lot 530, posted here by Roger, 17 May - the first two photos which he was not sure about. This last a bit on the small side - 135.5cm overall, 105.5cm blade. Some say it is from Castillon Group C (?) Others say, because it is a falchion, it can't be included. It certainly has a Castillon style hilt. BW at guard - 1.26"
Thank you Roger, I have wanted to see a pic of the castillion falchion for a long time. And measurements too! From all the articles I have read on them nobody knows when they went into the river. They were contained in barrels and on some sort of barge or boat probably, but the find itself is not specifically datable. I don't remember seeing anybody writing on these swords assert that they went into the river before the battle. Only their proximity to the site of the Battle of Castillon have associated them with the 1453 date - given that the river goes to Bordeaux, England's capital in Guyenne which fell into French hands in 1454 after 3 centuries of English rule, it is entirely possible that these swords were accidentally lost before or after the battle and totally unassociated to it. Though of course their artistic styles do place them between c.1440-1470ish. Like many of the other swords here, it's full stats etc have been published in the Park Lane Arms Fair catalogue over the years (this falchion was in the last issue). You'll also find that book sellers like Ken Trotman stock them. The article Matt (and Julien) refers to is called: 'Additional notes on the Swords of Castillon' by Clive Thomas in 'The Spring 2012 London Park Lane Arms Fair' p. 40 - 63. It also contains a long list of auctions where swords of Castillon have appeared and a bibliography. This issue also contains the article by Peter Johnsson on the proportions of medieval swords. The other articles are by E. Oakeshott in the issues of 1984 and 1993 which are not available anymore. 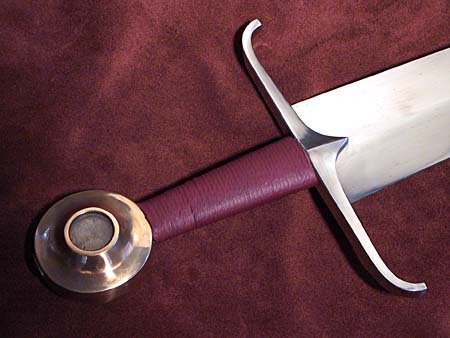 Two other issues (2001 and 2007) contain articles by Neil Melville on 15th Century English Two-Handed Swords. I must bow to your superior knowledge, Matt. I was wrong to make that blanket declaration. I based that statement on what Oakeshott had to say about it in Records of the Medieval Sword I quoted him in the first post of this thread, and will put it down again here so people don't have to go back to page one. Oakeshott writes, “That part of the Dordogne was the principal supply-route from the great English base at Bordeaux to the up-river castles which in the 1420s and 1440s were still precariously held by the English during the closing years of the Hundred Years’ War. They were evidently (or at least presumably) in a barge, which in some way was sunk, going up to Bergerac or Castillon with supplies. If they were swords going up river to resupply the English garrisons, it is unlikely that they would have been lost in the river after the battle, since they result was the end of England's presence in France (except for Calais) I suppose it could have happened right after the battle with supplies still going towards Castillon. As you say, I guess they could still have been on their way to Bordeaux untill sometime in 1454. The idea that these were swords garnered from the battlefield by the French has been discounted. I forget the reason - because there were no scabbards present? I got a copy of the Park Lane Arms Fair 2012 catalogue with the article by Clive Thomas. It has photos and extensive specs on eight Castillon swords, and photos of eight more. My only regret is that even more swords weren't shown and documented. I guess some of those showed up in the 1984 and 1993 articles, but Patrick says above that they are now unavailable. The photo in the first post indicates that there were two group types. Now there is a Group C, consisting of two type XXa swords with the backwards, pear shaped pommel. There are also a few that don't belong to A, B, or C, like the falchion, a few daggers, and a short sword (RA IX.2225). As to where and when the swords went into the river, Thomas says that it is still unclear. A few people do know the exact site, but are still keeping it a secret. Even if that place were definitively nailed down, Thomas thinks that they may have gone into the river upstream and travelled down until they finally got hung up at that dredging site. In Oakeshott's Records, he postulated that the swords were on their way up river to the English garrisons at Castillon or Bergerac sometime before the battle. Thomas says that in his 1993 Park Lane article, Oakeshott had changed his mind and believed that they were gleaned from the battlefield. That question will probably never be answered. Most of the "battle damage", nicks, etc. are really just the effects of corrosion. There are some indications of the presence of a few scabbards, but no metal fittings have survived. 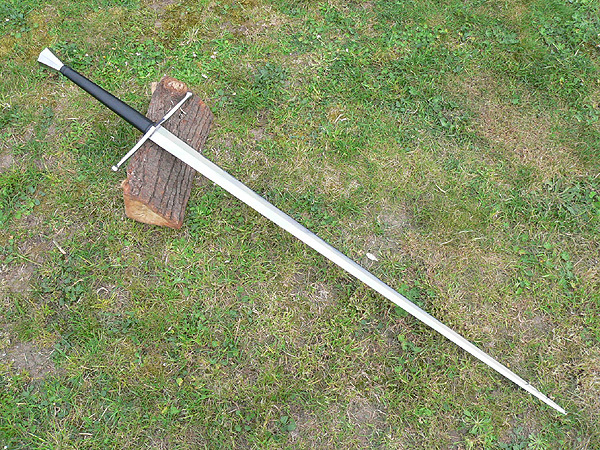 And another castillon inspired sword by French swordsmith Gael Fabre. Julien, thanks for this, an outstanding example. And in general, this maker has some nice looking swords. He does seem to like suede on his more modern looking creations. Yes, this is a very attractive piece, and a great photograph. That German maker is Arno Eckhardt. I know him well, he lives close to my place and heat treats my long blades. Good guy. Doesn't make swords anymore though, only back pipes. They're quite interesting musical instruments, I am a musician of many years, but his swords are lovely. And he appears historically capable with his own designs as well. Too bad. But, if he's happy. Anyway, you have him all to yourself. Sorry, I'm off topic here. Thanks for the summing up. I do have the 1993 article and it's a real shame that it isn't still available to buy. On the subject of edge damage, that's a tricky one. People don't seem to agree. I have personally 'played with' 3 of the Castillon swords - one at the most recent Park Lane fair - and I would say that some certainly seem to show signs of having been re-sharpened many times. It would not surprise me if some have edge damage from use, as these were clearly (IMO) used swords and not new ones. On the subject of why they were being transported, I think the balance of probability must be “loot”. I can’t buy the ‘supplying the troops’ suggestion. I have never ever seen any documents describing medieval English/Gascon soldiers being supplied with swords in bulk – soldiers were expected to supply their own swords. The only armaments they were ‘supplied’ with were arrows and ammunition. The English/Gascon army that fought at Castillon arrived fully equipped. Muster rolls of the time make it clear that even levied troops (such as the Gascons) had to provide a minimum of equipment for themselves. Then there is the varied assortment of the find – around 70 one-handed swords, around 5 longswords, 3 great swords, one falchion, one short sword and 3 daggers. Some of which may have been in scabbards, most not. This is not, to me, likely to be the assortment of swords/daggers one might expect to find if these were being ‘supplied’. It is however the sort of assortment one might expect if they had been taken from a defeated enemy, where the victors were only taking the good quality swords for sale (leaving the poor quality bollock knives and falchions). Of course these are not necessarily the weapons of fallen English/Gascons – just prior to the Battle of Castillon an advance party of the English army defeated a body of around 500 French troops near by. These weapons could just as easily be English loot being returned to Bordeaux as the English army continued its campaign that led to the disaster at Castillon. that led to the disaster at Castillon. Disaster for the people of Gascony who wanted to remain under English control and feared the French oppressors. Remember, a large chunk of the 'English' army at Castillon was made up of Gascons.